The Barber of Siberia was a curious intervention in the debate over Russia’s past, its future, and, most important, its identity. Authored by a man so thoroughly identified with his own fantasies of Orthodox, monarchic traditionalism that he cast himself in the role of Tsar Alexander III, the film unsuccessfully negotiated the geopolitics of global cinema. Everything about Barber itself was designed to portray a positive image of Russia and Russians: the cadet core is filled with honest, earnest young men, the Tsar himself is good, the nobility and common people even better, while the greatest threat to the country is an overreaching, blundering America that wants to turn the country’s natural resources and natural beauty into fodder for a global capitalist mill. 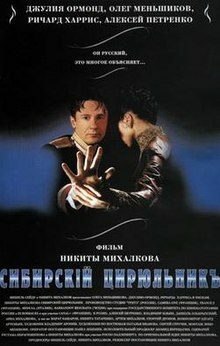 The film tries to pander to everyone: flattering to Russian viewers, it nonetheless revels in stereotypes about the Russian soul that verge on minstrelsy, most notoriously, the Maslenitsa (pre-Lenten festival) scene, when a Russian officer starts drinking only to go on an epic spree. Russians often complain that Westerners think their country is nothing but vodka and dancing bears, and this is, quite literally, what Barber of Siberia supplies. Had a foreigner made this movie, it would have been offensive.